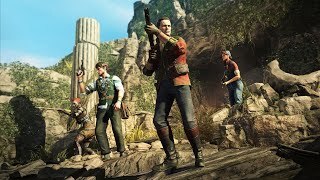 Strange Brigade game for adventure seekers. Heroes of events are sent to the undeveloped territories of the British Empire. This happens in the 30s of the last century, and even the demo is styled as a cinema of those years. It seems that you are really watching an adventure film or newsreel, where important events of the expedition are documented. This is indeed displayed in the plot, and you will not be an idle observer of other people's exploits, but you yourself will be able to accomplish all of them. Once the archaeologists discovered the location of the ancient tomb, where a mysterious artifact is buried, which has been searched for for many years. In the depths of the impenetrable jungle, a special detachment was assembled, assembled from representatives of various professions, in order to make the expedition the most fruitful. Each participant has unique knowledge and skills, owns a certain set of tools and weapons. Naturally, they have received special training, and in the event of a critical situation they will be able to work together, but each according to his talents. Although there are four participants in the group, there may be fewer if you wish. However, if you decide that you can cope with the task alone, you go to the thicket all alone, but the effectiveness and chances of surviving will drop significantly. Starting in Strange Brigade to play, you will find a flight on an airship. When you find yourself at the right point, landing with parachutes. From this moment begins the most interesting. You have to explore all the hidden corners of the area in search of tips on how to find the main mysterious artifact. Ancient to hide it, not just placed in one of the distant caves, but also defended by a dark curse. Now he is guarded by an army of mythological creatures led by the Egyptian witch queen. It is necessary to cross the line of what is permitted, how the army of the dead rises from dust and ruins. It leaves the cozy crypts to destroy the insolent, who decided to invade their shrine. 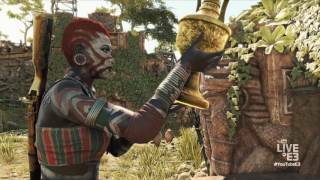 B Strange Brigade you will encounter mummies, Egyptian deities such as Anubis, and other creatures. Waiting for you revived horror in which to survive. When fighting with otherworldly soldiers, do not forget that the mission is considered fulfilled only in the case when its ultimate goal is reached. Find an ancient relic, and go home with it.